More than $1 million worth of gold artefacts, including a rare coin destined for the King of Spain, have just been discovered in the shallow waters approximately 30 miles north of West Palm Beach. A family of professional treasure hunters, called the Schmitts, made the find. The treasures were found among the 1715 Treasure Fleet, which sank as the result of a hurricane after leaving Havana, Cuba almost exactly 300 years ago. The artefacts, which were only about 15 feet deep in the water, included 51 gold coins and 40 feet of ornate gold chain "These finds are important not just for their monetary value, but their historical importance," said Brent Brisben, owner of 1715 Fleet-Queen's Jewels, LLC. "One of our key goals is to help learn from and preserve history, and this week's finds draw us closer to those truths." Since the ship was recovered more than fifty years ago, divers have discovered about $50 million worth of treasure and it is thought more than $400 million worth of treasure may still be hiding below the sea. Unfortunately, Queens Jewels LLC owns the salvaging rights to the entire fleet. However, if you are still interested in visting the area why not consider a luxury yacht charter in Florida? More than $1 million worth of gold artefacts, including a rare coin destined for the King of Spain, have just been discovered in the shallow waters approximately 30 miles north of West Palm Beach. 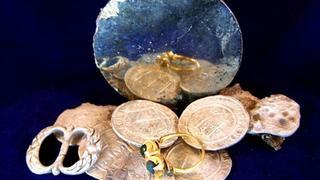 A family of professional treasure hunters, called the Schmitts, made the find. "These finds are important not just for their monetary value, but their historical importance," said Brent Brisben, owner of 1715 Fleet-Queen's Jewels, LLC. "One of our key goals is to help learn from and preserve history, and this week's finds draw us closer to those truths." Since the ship was recovered more than fifty years ago, divers have discovered about $50 million worth of treasure and it is thought more than $400 million worth of treasure may still be hiding below the sea. Unfortunately, Queens Jewels LLC owns the salvaging rights to the entire fleet. However, if you are still interested in visting the area why not consider a luxury yacht charter in Florida? A treasure that was thought to be forever lost has now seen the light of day after £50 million of cargo, namely silver rupee coins, was recovered from the British steam ship SS City of Cairo by Deep Ocean Search, earlier this year (April 2015). During a passage from India to England in 1942, SS City of Cairo was struck by German U-boat and sunk 480 miles south of the Atlantic island of St Helena. Found at a depth of 5,150 metres, SS City of Cairo set a world record for the deepest recovery – by comparison, the famed Titanic wreck is found at 3,800 metres deep. The record-breaking depth did not make the shipwreck dive easy. "The combination of pressure, temperature, repeated dives at this depth and other issues resulted in multiple breakdowns of systems such as we had not experienced before,” the team reported. A treasure that was thought to be forever lost has now seen the light of day after £50 million of cargo, namely silver rupee coins, was recovered from the British steam ship SS City of Cairo by Deep Ocean Search, earlier this year (April 2015). During a passage from India to England in 1942, SS City of Cairo was struck by German U-boat and sunk 480 miles south of the Atlantic island of St Helena. Found at a depth of 5,150 metres, SS City of Cairo set a world record for the deepest recovery – by comparison, the famed Titanic wreck is found at 3,800 metres deep. 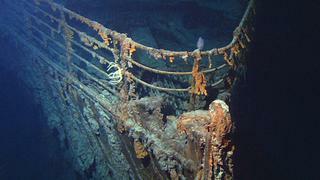 The record-breaking depth did not make the shipwreck dive easy. "The combination of pressure, temperature, repeated dives at this depth and other issues resulted in multiple breakdowns of systems such as we had not experienced before,” the team reported. 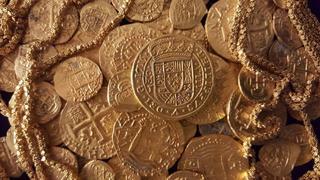 The largest monetary treasure haul found was on the wreck code named Black Swan, discovered by Odyssey Marine Exploration in 2007 off of Gibraltar. The salvage team reportedly found 17 tons of coins valued at $500 million; an amount that is both staggering and said to be “unprecedented” in the treasure hunting world. The crew didn’t release the Black Swan dive site or details on the type of coins it uncovered, and promptly flew its haul back to the US. This caused a courtroom brawl, with the Spanish government filing a claim on the treasure and the US Federal Court demanding Odyssey reveal the wreck’s location. After five years of litigation, the courts ruled in Spain’s favour and the treasure had to be flown back across the pond. The largest monetary treasure haul found was on the wreck code named Black Swan, discovered by Odyssey Marine Exploration in 2007 off of Gibraltar. The salvage team reportedly found 17 tons of coins valued at $500 million; an amount that is both staggering and said to be “unprecedented” in the treasure hunting world. The crew didn’t release the Black Swan dive site or details on the type of coins it uncovered, and promptly flew its haul back to the US. This caused a courtroom brawl, with the Spanish government filing a claim on the treasure and the US Federal Court demanding Odyssey reveal the wreck’s location. After five years of litigation, the courts ruled in Spain’s favour and the treasure had to be flown back across the pond. An old man was selling a coin in a town in Dominican Republic town that turned out to be the oldest coin ever minted in the New World. So begins the story of the most surprising wreck – and possibly oldest shipwreck treasure – ever found. The team of Deep Blue Marine used side scan sonar to search the area where the local man found the coin, and were happily surprised to find parts of the wrecked ship. In their treasure haul they also found jade statues, ancient Mayan jewellery and gold coins dating back to 1535. A set of four coins alone are valued at $1 million. Deep Blue Marine got to keep 50 per cent of their discovery while the rest went to the Dominican Republic government. It it likely that ship sank during a hurricane just a few years after Christopher Columbus discovered the New World and a shipwreck has never turned up artifacts that were so old. An old man was selling a coin in a town in Dominican Republic town that turned out to be the oldest coin ever minted in the New World. So begins the story of the most surprising wreck – and possibly oldest shipwreck treasure – ever found. The team of Deep Blue Marine used side scan sonar to search the area where the local man found the coin, and were happily surprised to find parts of the wrecked ship. 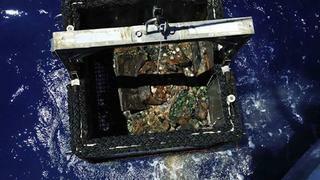 In their treasure haul they also found jade statues, ancient Mayan jewellery and gold coins dating back to 1535. A set of four coins alone are valued at $1 million. Deep Blue Marine got to keep 50 per cent of their discovery while the rest went to the Dominican Republic government. It it likely that ship sank during a hurricane just a few years after Christopher Columbus discovered the New World and a shipwreck has never turned up artifacts that were so old. The Titanic is perhaps the most famous shipwreck of all time, not only because of the tragic story of her sinking by striking an iceberg in 1912, but also for the magnificent treasure that went down with her. She carried many wealthy guests, and it’s estimated that $300 million worth in diamonds were lost in the wreck. The luxury ocean liner was found south of Newfoundland in 1985 by a team of American and French researchers. In 2012, right on cue for Titanic’s centennial birthday, nearly 6,000 items recovered from the wreck went up for sale at two auction houses in the US. The list included a diamond bracelet, dishware and even personal items such as a postcard a passenger wrote to his parents. Treasures from the Titanic continue to go up for offer, with a handful of deckchairs auctioned by Henry Aldrige & Son in April. The Nantucket wooden chairs would have had a home on the ship’s first-class promenade deck – they are now too delicate to be used for seating, but fetched a staggering £85,000 when auctioned. The Titanic is perhaps the most famous shipwreck of all time, not only because of the tragic story of her sinking by striking an iceberg in 1912, but also for the magnificent treasure that went down with her. She carried many wealthy guests, and it’s estimated that $300 million worth in diamonds were lost in the wreck. The luxury ocean liner was found south of Newfoundland in 1985 by a team of American and French researchers. In 2012, right on cue for Titanic’s centennial birthday, nearly 6,000 items recovered from the wreck went up for sale at two auction houses in the US. The list included a diamond bracelet, dishware and even personal items such as a postcard a passenger wrote to his parents. Treasures from the Titanic continue to go up for offer, with a handful of deckchairs auctioned by Henry Aldrige & Son in April. The Nantucket wooden chairs would have had a home on the ship’s first-class promenade deck – they are now too delicate to be used for seating, but fetched a staggering £85,000 when auctioned.